One of our readers sent us a photograph and asked us to identify the specimen in it. He explained that he found it crawling on his hardwood bathroom floor. 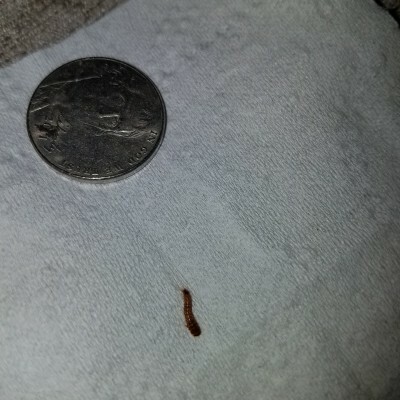 The picture shows the organism on a tissue, smartly placed next to a quarter for size comparison. We know this creature quite well since readers find them all the time and they are often featured in our articles. 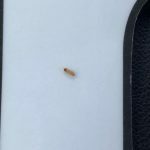 This is a carpet beetle larva. 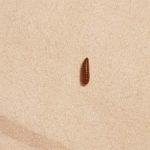 There are three types of carpet beetle larvae: furniture, varied, and black. They are similar in behavior but vary slightly in appearance. 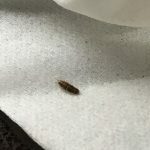 Furniture carpet beetle larvae are white with red/chestnut/brown bands lining their bodies. Varied carpet beetle larvae have light and dark brown stripes lining their bodies, and are covered in dark hairs. And finally, black carpet beetle larvae are black or dark brown and aren’t covered by as many hairs. Based on the picture, we think this might be a black carpet beetle larvae. 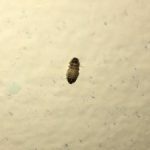 Though we aren’t completely sure, it doesn’t actually matter a ton, since all carpet beetle larvae act the same and have similar feeding behaviors. Carpet beetle larvae eat a lot and they make quite a mess. They feed on a wide range of household goods such as carpets, animal products, clothing, upholstered furniture, bedding, towels, pet hair, stored food….and the list goes on! They have destructive eating habits, which makes them particularly annoying household guests. In order to avoid serious damage, we recommend that our reader act fast to get rid of them! Luckily, getting rid of carpet beetle larvae is pretty straightforward, as it just requires cleaning. The difficult part is that the cleaning has to be intense in order for it to work and for the larvae to be gone! 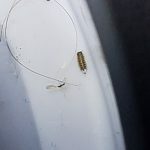 The first thing our reader will need to do is identify the food source for this larva. Since he found it in his bathroom, that is a good place to start. He should check the entire bathroom and wherever he stores towels and linens. If he doesn’t find anything, he will have to go searching room to room until he does. Once the source has been found and removed, the cleaning regime must begin! 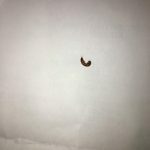 Doing laundry, vacuuming, sweeping, and dusting every day will ensure that there are no more larvae or eggs lurking around. 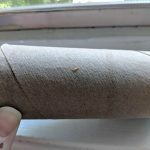 To wrap up, the organism that our reader found in his bathroom is a carpet beetle larvae. If he would like more information on how to get rid of these specimens, their lifestyle, or feeding habits, we encourage him to read one of our numerous articles on the matter! He can do that by typing ‘carpet beetle’ in the search box on our site. 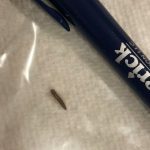 The organism our reader found in his bathroom is a carpet beetle larvae.